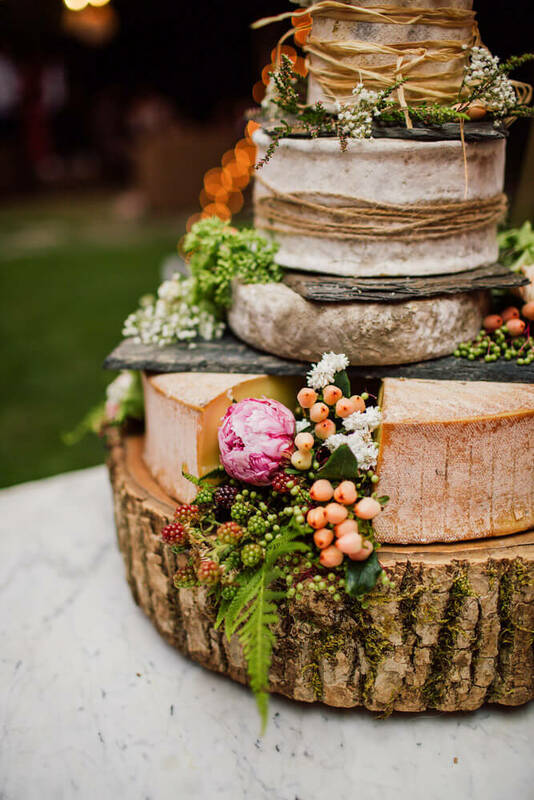 Imagine picking up the knife on your wedding day, your partner’s hand in yours, and cutting deep into a delicious, soft…wedge of Abondance cheese? 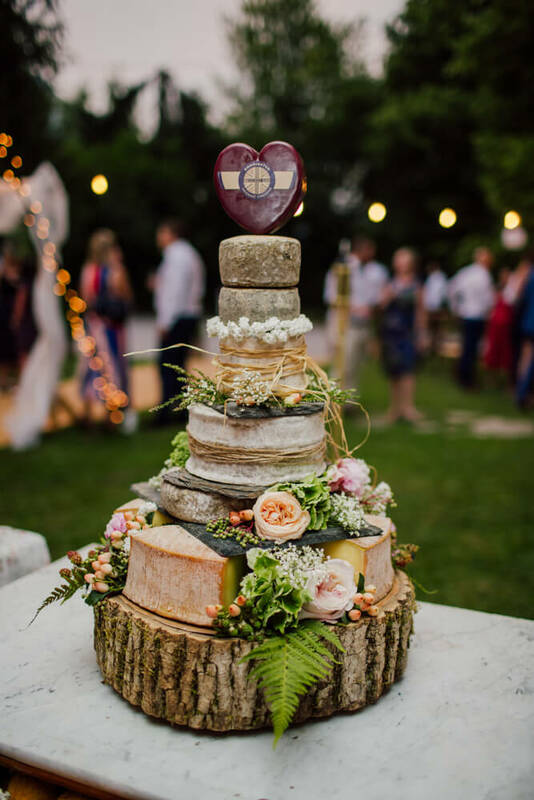 It doesn’t get much more French than the Cheese Tower Wedding Cake. 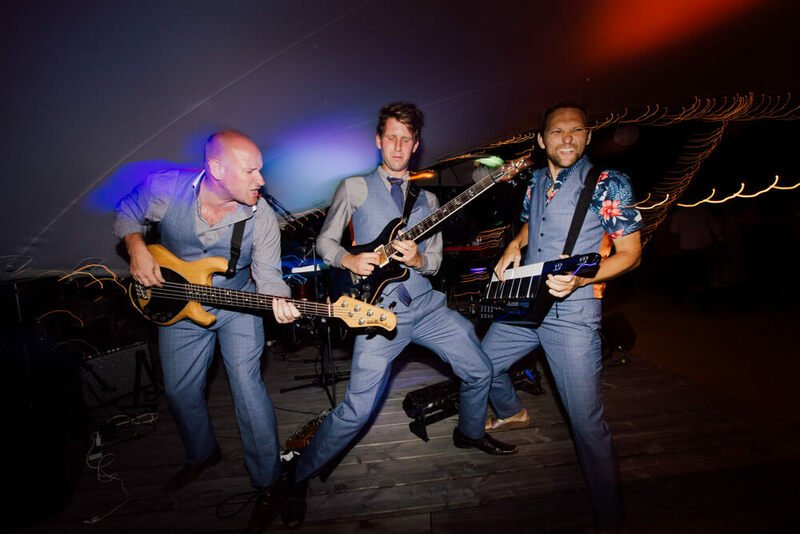 As you may know, we’re wedding photographers based in the resort of Morzine in the French Alps. 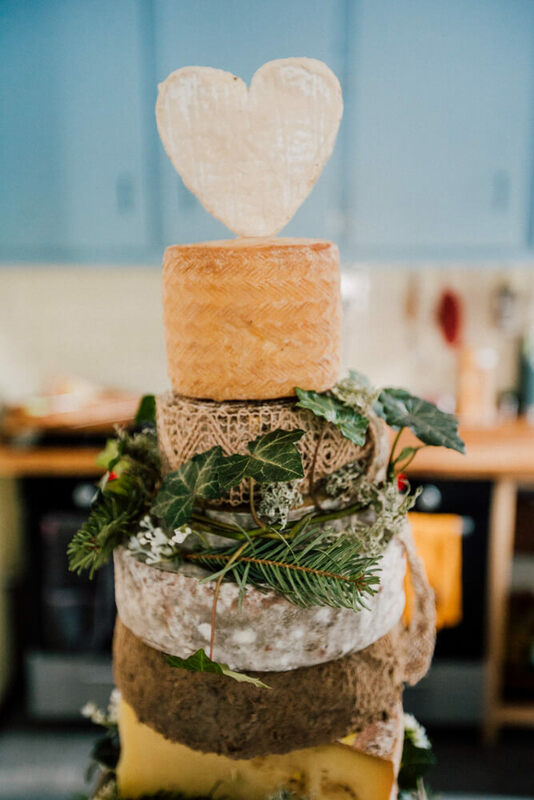 One trend we’ve noticed recently is of couples looking to make a statement – and indulge their love of cheese – by opting for a “Cheese Tower Wedding Cake”. 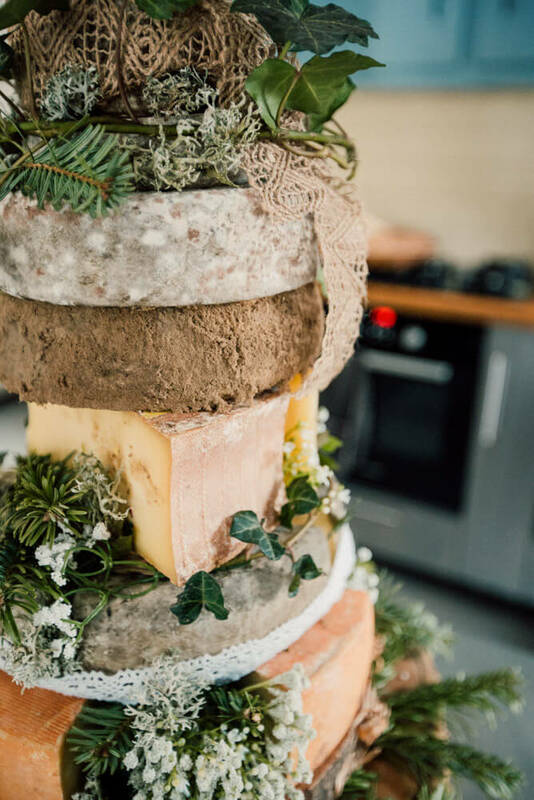 We caught up with Bon App, weddings caterers and cheese tower creators, to find out what goes into making a cheese tower cake and why they’re perfect for your wedding day. 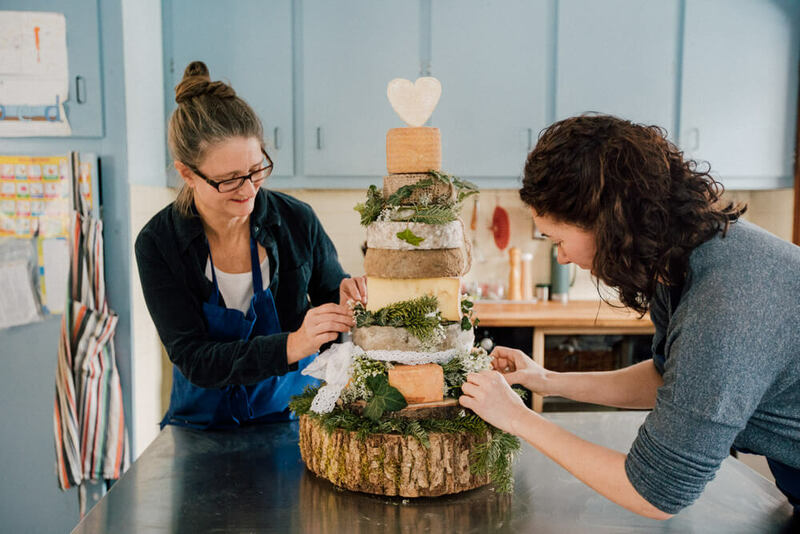 The Cheese Tower Cake is just that: a traditional wedding cake in shape, but made entirely of locally-sourced French cheese. Sometimes it replaces the classic sweet sponge cake, but often couples choose to have both. We think the cakes make an amazing focal point for your big day and, from our experience, can look incredible in wedding photographs. The cakes are usually served at the end of the day as part of the evening buffet. 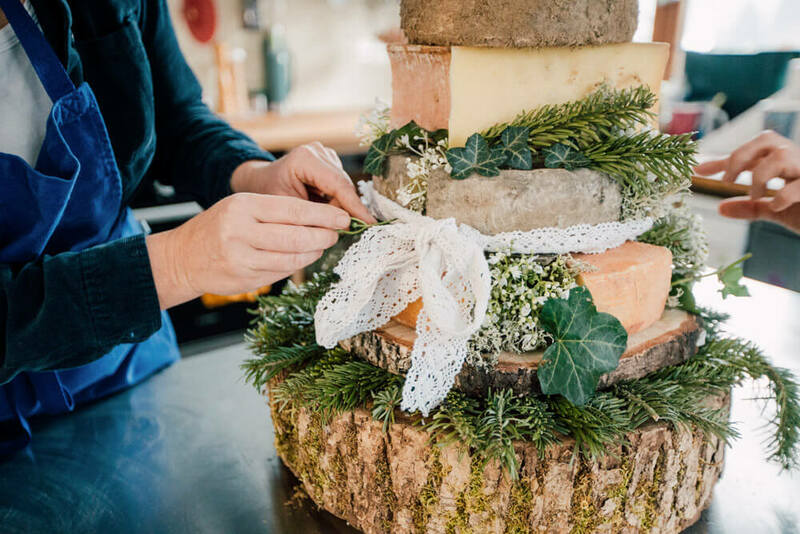 Once everyone has had their evening meal, Michelle & Tamsin will break down the cheese tower, slice the cheese and serve it up with fresh fruit, homemade chutney, charcuterie and different breads and crackers. The hard cheese has the added benefit of being versatile: you can store it and eat it later on in your stay – perhaps as part of a BBQ – and you can even take it home with you. “Hard cheese freezes very well, so it can go back in your freezer – a bit like the British tradition of saving the top tier of your wedding cake”, Michelle suggests. 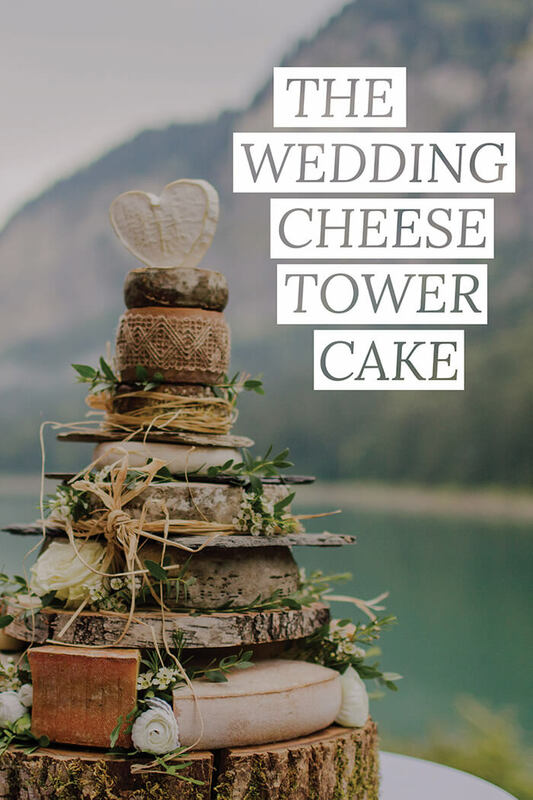 A typical wedding cake-sized cheese tower will easily feed 100 guests, so it’s not only delicious but a cost-effective choice for bigger weddings. 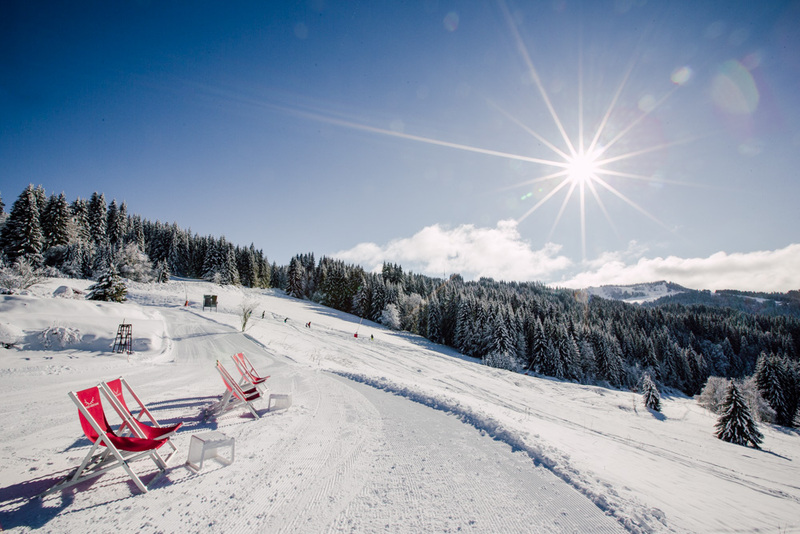 Bon App use almost exclusively locally-produced cheese from the Alps, including favourites such as Raclette, Abondance and Tom. They start with a slice of chopped wood for the base, oiled to make it food-safe. Whole wheels – or wedges – of hard cheese are then placed between more slices of wood and Morzine slate for stability. We try and make everything quite local, so everything has a reference point back to where we are. Whether it’s the wood, the slate, the cheese – or us! The pair then artfully arrange a variety of flowers and plants around the cheese. The foliage they use usually depends on the season, with food-safe ivy and fir branches the typical choice for Winter season weddings. Bon App will also work with the couple to plan the colour scheme. 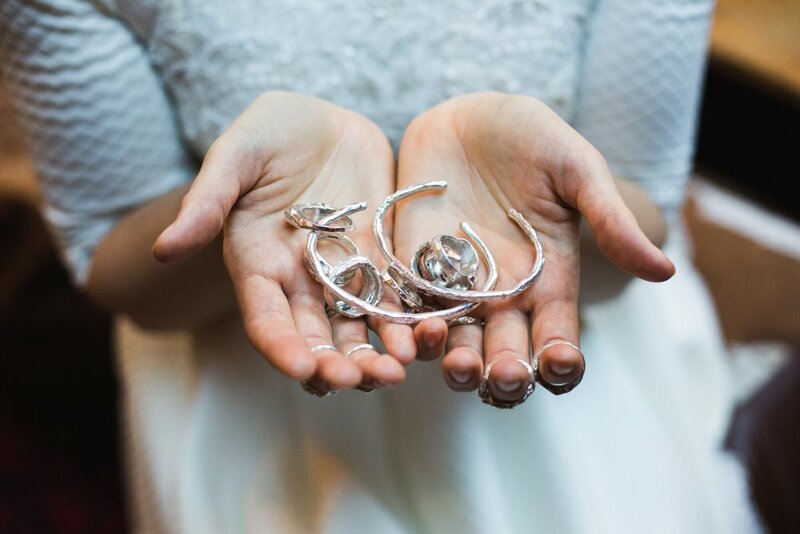 Thanks to their relationships with several local wedding florists, they’re able to use offcuts from the wedding decorations which helps tie everything together with matching colours. This also has the benefit of making each cake completely unique. The number one reason you wouldn’t want to make this yourself on your wedding day is you will absolutely stink of cheese! Not ideal for your first dance! By working with local suppliers, Bon App also get access to bigger wheels of cheese than you might find in supermarkets. 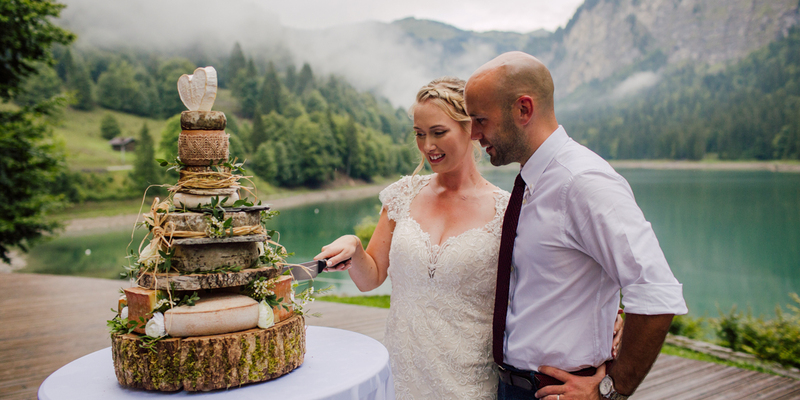 We wanted to know why the Cheese Tower Wedding Cake has become so popular at weddings in the French Alps. Two winters ago we had to deliver a sponge wedding cake to Lindarets (a ski area high above Morzine), made and iced in advance and then loaded into a backpack. 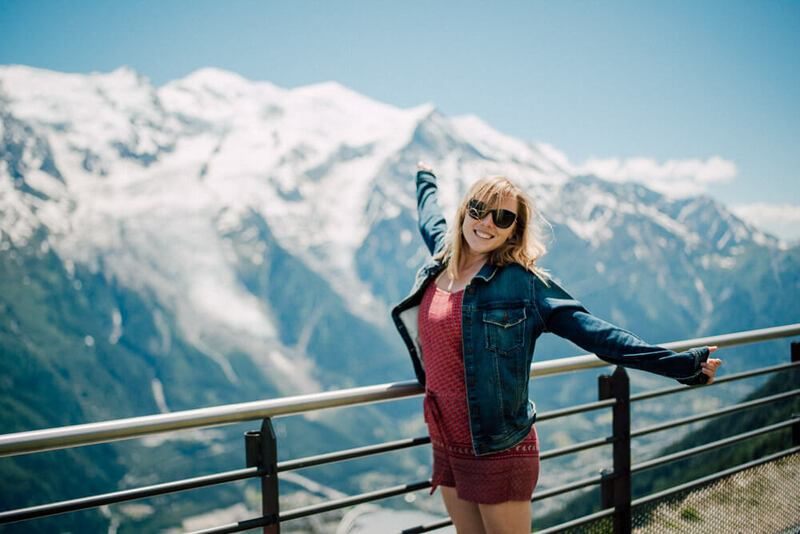 We went up the bubble lift and then carefully skiied to the venue!” Michelle laughs. “We can literally go anywhere! 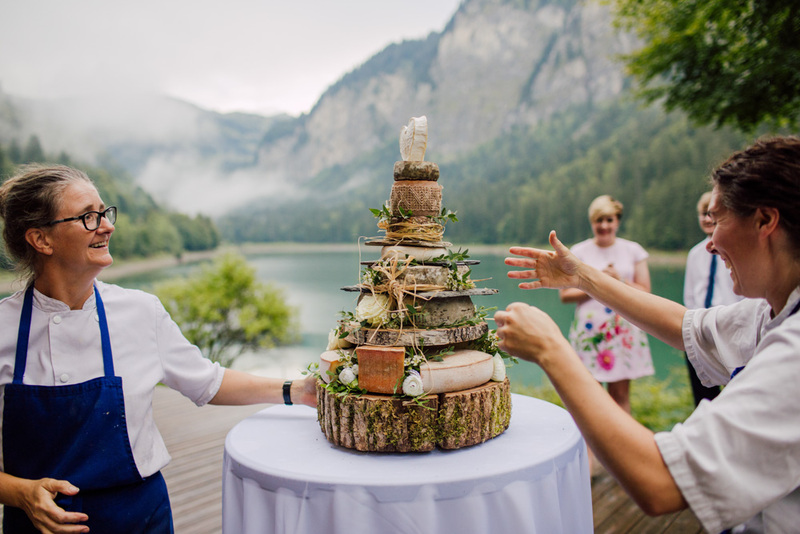 If you’re looking for a delicious showstopper piece for your wedding in the Alps, it doesn’t come much more unique than the Cheese Tower Wedding Cake. We’ve made a video of our day with Bon App so you can see the process in action, and wet your taste buds! 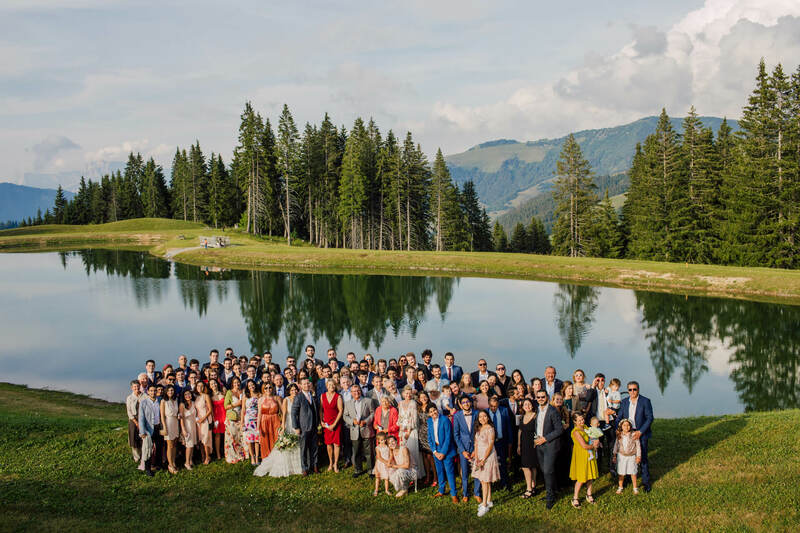 Don’t forget to subscribe to our Youtube channel for more inspiration for your wedding day in the Alps.